The City of San Diego has completed a four-year, $11 million project to rehabilitate the East Mission Gorge Trunk Sewer, a seven-mile-long section of the wastewater collection system that passes through some of the city's most historic and environmentally sensitive areas. Insituform Technologies, Inc.
Non-disruption of normal activities, such as traffic flow, was particularly important to the community, according to Jeffrey Shoaf, a senior civil engineer in the city's Engineering & Capital Projects Department. "Because of the sewer's location, this project had the attention of every government, civic and special interest group you could think of," said Shoaf. "Everyone had a different – and perfectly valid – reason why they wanted to protect the area from disruption." Insituform Technologies, Inc.
"Digging up and replacing this deteriorated sewer was really not an option," he continued, adding that a trenchless method was clearly the least disruptive approach in this case. The project was awarded to , which used its cured-in-place pipe (CIPP) methods to complete the high-profile project with minimal affect at ground level. Insituform Technologies, Inc. In service since 1963, the East Mission Trunk Sewer carries millions of gallons of wastewater each day from San Diego and its surrounding suburbs to a plant at Point Loma for treatment. En route, the sewer passes through historic Mission Trails Regional Park, a popular scenic venue that is home to both Native American and California Mission artifacts. Insituform Technologies, Inc. Crossing the San Diego River at several points, the pipeline also runs near a dam built by Indians in 1805 to supply water to the mission, as well as through a riparian habitat that is home to a variety of endangered plant and animal life. Insituform Technologies, Inc.
Obstacles Forced Stretching the Schedule Insituform Technologies, Inc.
"From Day One, we had a lot of constraints on how – and when – we could perform our work," noted Shoaf. Despite the urgency of the repairs, no construction could occur, for example, between March 15 and September 1 each year. This break in the schedule was called for so as not to interrupt the mating season for two endangered bird species -- the Vireo Belii (Least Bell's Vireo) and Polioptila Californica (California Natcatcher). And the need for the repairs was indeed urgent, according to a report prepared in September 1994 by the consulting engineering firm of Dudek & Associates of Encinitas, CA. Insituform Technologies, Inc.
from the top of which it is fed into a manhole. 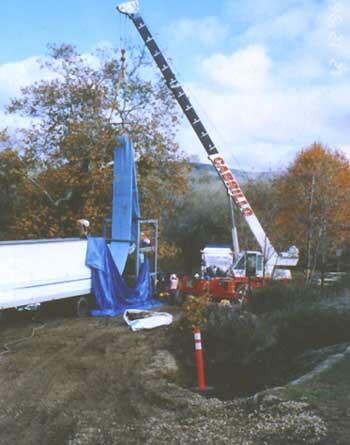 Insituform Technologies, Inc.
Over time, the river had washed away much of the wastewater pipeline's cover, exposing that to large, falling rocks in some areas. Due to deterioration, root intrusion and the deposit of debris, the 36- to 42-in.-diameter concrete sewer was capable of transporting only 25 million gallons a day (mgd) of wastewater at the time the study was conducted, down 14% from its original flow capacity of 29 mgd. In addition, more than one million gallons of river water were infiltrating the pipe every day, placing an additional, unnecessary load on the city's treatment plant. Insituform Technologies, Inc.
"The communities served by the sewer are all growing," noted Shoaf, adding that as time passed, the problem was getting worse. However, using its CIPP process, Insituform has been able to restore the deteriorated line, and at the same time maintain wastewater collection service while the project was underway. Insituform Technologies, Inc. In this CIPP process, a custom made felt tube is impregnated with resin and inverted (turned inside out) in the deteriorated pipe from an existing manhole. Hot water is then circulated through the tube, curing the resin and forming a jointless and corrosion-resistant pipe-within-a-pipe. A single inversion usually is completed in a day. Insituform Technologies, Inc.
Back to the Top Insituform Technologies, Inc.
Poor Access, El Nino Rains Complicate Construction Insituform Technologies, Inc.
Rehabilitating more than seven miles of the East Mission Gorge Trunk Sewer required not one, but 25 total inversions, the longest of which was 2,800 ft. Many of the inversions were completed in less than ideal conditions. 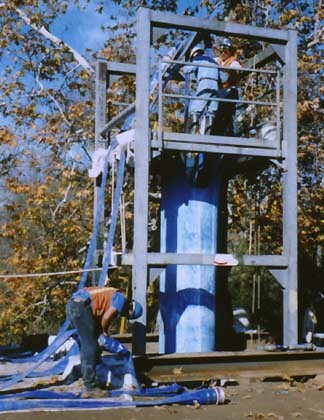 Insituform Technologies, Inc.
tube is filled from the elevated platform. Insituform Technologies, Inc. According to Jeffrey Shoaf, two-thirds of the pipe's route did not have vehicular access. Consequently the contractor installed temporary and permanent river crossings that it could use to reach the construction site after completing preparation work elsewhere. Because the project had to be completed in phases during the fall and winter months, weather conditions were also often quite treacherous, requiring the crews to work in the River Gorge when the water level was highest. Despite massive, El Nino-initiated rains in the spring that delayed construction further, the project was completed late in 1998 under its original budget. Insituform Technologies, Inc.
"The most gratifying outcome," said Shoaf, "was the lack of complaints generated by our work. Early on and throughout the project, we took great efforts to communicate with everyone from the citizen advisory groups and federal agencies to the park rangers and visitors about what we were doing. Then we did what we said we'd do, and it really paid off." Insituform Technologies, Inc.